College of the Mainland representatives attended the Galveston County Day at the Capitol on March 6,. Pictured are (l-r) Paige Parrish, Cindy Lewis, Ruth Rendon and Dr. Warren Nichols. Among those who attended were COM President Dr. Warren Nichols, Cindy Lewis, director of the Gulf Coast Safety Institute; Paige Parrish, associate dean of workforce and continuing education as well as COM Communications Officer Ruth Rendon. 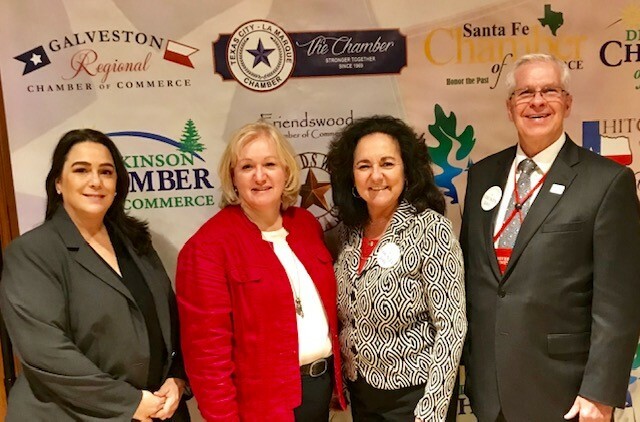 The group was split up into small groups and assigned to visit state senators and state representatives from throughout the state to bring attention to issues affecting Galveston County. Issues included the coastal spine and disaster relief management. Those participating were recognized by the House of Representatives and by the Senate. County leaders and members of the planning committee posed for a picture with Governor Greg Abbott and the entire Galveston County delegation gathered for a group picture on the steps of the Capitol. After a day of crisscrossing the Capitol, a seafood feast Legislative Reception was held to end the day.